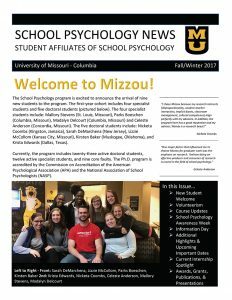 The primary mission of the MU School Psychology program is to train the next generation of leaders in research, teaching, clinical practice, and policy in psychology and education who are singularly focused on solving significant societal challenges. We prepare our graduates to take leadership positions in universities, preK-12 schools, and community/hospital-based settings. We envision these professionals to be data-driven, system-wide problem-solvers and change agents who work to address issues facing learners and youth of all ages. The program and faculty take an integrated, systems approach to academic, behavioral, and mental health, evidence-based practice with world-class research lines in prevention science, assessment, and intervention. Guided by a scientist-practitioner training model, the Program prepares students to integrate theory, research, and established methods of scientific inquiry into effective practice and to engage in research and scholarly activities that contribute to both the science and practice of psychology. Degrees are in educational, school and counseling psychology with an emphasis in school psychology. The School Psychology program is led by highly productive, nationally recognized faculty. They hold leadership roles in key professional organizations and premier publication outlets in our field, engage in cutting edge research, and apply a progressive problem-solving framework to school psychology. Click on links below to learn more about them and their areas of expertise. Faculty members who will be accepting new doctoral advisees for the 2018-2019 school year are marked with an asterisk (*). The doctoral program is accredited by the Commission on Accreditation of the American Psychological Association (APA) and the National Association of School Psychologists (NASP). Questions related to the program’s APA accredited status should be directed to the APA Commission on Accreditation. Questions related to the program’s NASP approval status should be directed to the NASP Program Review Board. Both degree programs are approved by the Missouri Department of Elementary and Secondary Education and lead to certification as a school psychologist in the state of Missouri. To be eligible for employment in states other than Missouri or for psychology licensure (doctoral-level only), a greater number of courses and internship hours may be required.